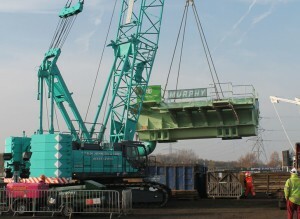 UK crane rental company GH Johnson Crane Hire has bought two new CKE800G crawler cranes from Kobelco Cranes Europe. Adding the 80 tonne capacity lattice boom units increases the Kobelco count in Johnson’s fleet to 18 units. The five added in the last 12 months were three CKE1350G and two CKE1100G crawlers. Engines in the G series cranes comply with European Union Stage IIIB (Tier 4i) exhaust emission regulations. They have diesel particulate filters (DPFs) and exhaust gas cleaning systems to minimise harmful emissions of particulate matter and oxides of nitrogen (NOx). Delivery of both new units will be in April.